It is fun to use and makes every glass of wine taste better! The best flavors and aromas of your wine can only emerge when you let it breathe. It requires a long waiting time.But WOHOME Electric Wine Aerator And Dispenser injects air bubbles directly into the wine, instantly releasing aromas and flavors, resulting superior tasting glasses of wine. 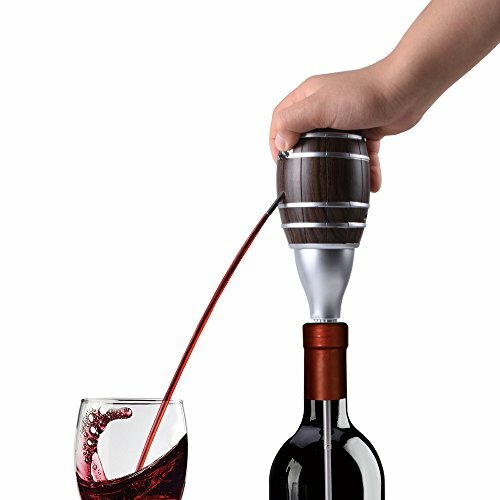 EASY TO USE-With the push of a button perfectly aerated wine is delivered straight to your glass. EASY TO CLEAN-Equipped with a retractable food grade stainless steel tube,easy to cleaning. UNIQUE DESIGN-Just like a beautiful casks ,smart and elegant .